Master Bayesian Inference through Practical Examples and Computation - Without Advanced Mathematical Analysis. Bayesian methods of inference are deeply natural and extremely powerful. However, most discussions of Bayesian inference rely on intensely complex mathematical analyses and artificial examples, making it inaccessible to anyone without a strong mathematical background. Now, though, Cameron Davidson-Pilon introduces Bayesian inference from a computational perspective, bridging theory to practice–freeing you to get results using computing power. 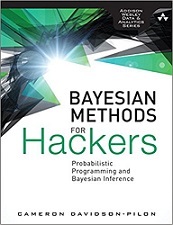 This book illuminates Bayesian inference through probabilistic programming with the powerful PyMC language and the closely related Python tools NumPy, SciPy, and Matplotlib. Using this approach, you can reach effective solutions in small increments, without extensive mathematical intervention. This book is designed as an introduction to Bayesian inference from a computational understanding-first, and mathematics-second, point of view. The book assumes no prior knowledge of Bayesian inference nor probabilistic programming. Cameron Davidson-Pilon has seen many fields of applied mathematics, from evolutionary dynamics of genes and diseases to stochastic modeling of financial prices. His main contributions to the open-source community include Bayesian Methods for Hackers and lifelines. Cameron was raised in Guelph, Ontario, but was educated at the University of Waterloo and Independent University of Moscow. He currently lives in Ottawa, Ontario, working with the online commerce leader Shopify.